As one of the world’s most scenic coastal drives, the Great Ocean Road should be a bucket list item for anyone visiting the state of Victoria in Australia. Due to its proximity to the city of Melbourne, this adventurous and diverse road trip is not only accessible but also relatively easy to plan. This road starts on the east in Torquay and winds along the south-west coast of Victoria for 244 kilometers until it reaches Allansford on the west. 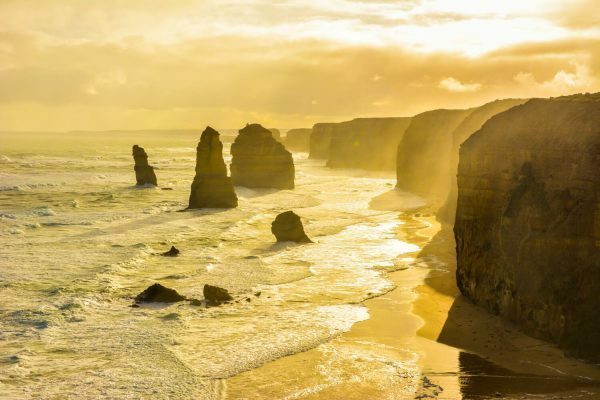 As you drive, you’ll traverse dozens of beaches, rainforests, and stunning limestone and sandstone cliffs – including the famous Twelve Apostles. 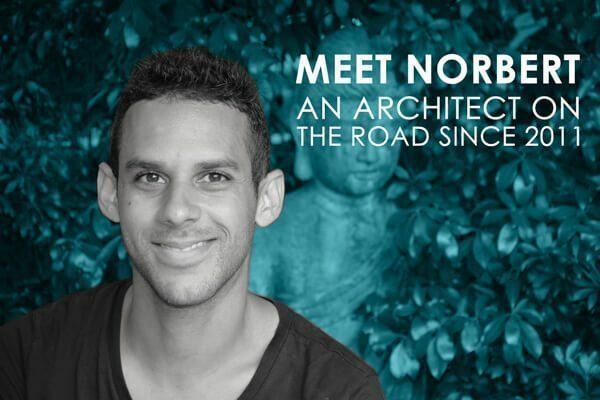 To tackle this long, yet visually striking road, here I’ll share with you how to plan a road trip along the Great Ocean Road, and hot to make the best of it. While it’s possible to do it as a long day trip, it is not recommended doing the Great Ocean Road in one day. With 244kms each way, and with dozens of potential stops along the way, this is one road trip that deserves at least a few days. You don’t want to be stuck in your car driving all day just to see the Twelve Apostles and then back to Melbourne, right? For that reason, it is recommended to at least break the trip in two, preferably three days or more. Take your time to admire the scenery at each lookout, enjoy your time at each small town, walk through nature and spot the native wildlife, and so on. As with every trip, do your research before starting the trip. Familiarize yourself with all the stops you want to do and split your trip in as many days as you want, based on how much you want to see. 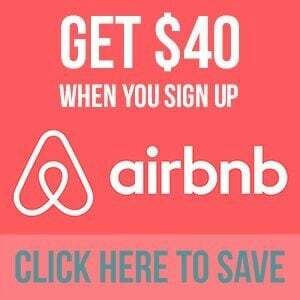 This will help you plan your accommodation in advance. 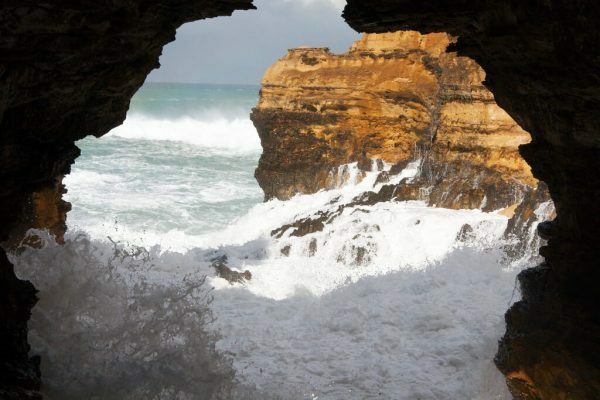 Two good websites you can check are the official Visit Great Ocean Road and Visit Victoria. They have tons of information about the Great Ocean Road and all the sights and activities available. 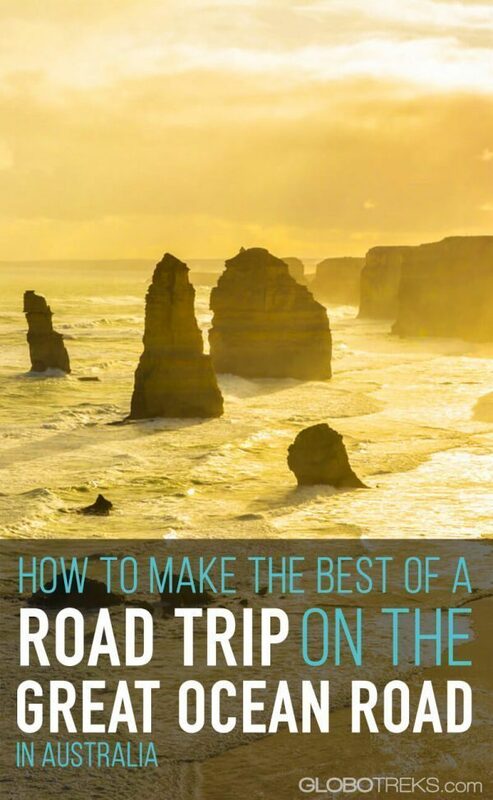 While these sites are useful, I personally got the best lookout and sightseeing spot tips by using the Trover app while I was driving along the Great Ocean Road. Trover is a location-based app that shows you the nearest sightseeing spots, restaurants, curious points of views, and everything in between, via a photographic grid. These crowdsourced, geo-located photos are arranged from nearest to farthest, and when you click on each, you’ll get additional information about them as well as the location of the image. For me, Trover served as great inspiration to replicate or mimic a few stunning images of some of the most famous sights, as well as discover a few other sights that I overlooked during my research! I’m including the Trover Widget here so you can see how the grid looked like when I was at the Twelve Apostles and how it showed me what was around it too. A lot of their photos are quite stunning, aren’t they? Also, don’t forget that some of the best travel experiences are those not found in guidebooks, so be open to taking detours to taste that unnamed restaurant, relax at that deserted beach, and hike those other nature trails. Discover and explore further with your adventurous spirit. Unless you’re in Melbourne and are only interested in seeing the Twelve Apostles on a day trip, I highly recommend not doing a tour. Instead, rent a car, or even better, a campervan, so you can take your time and stop wherever you feel like spending some extra time. Trust me, you will want to stop at a lot of lookouts and small towns! It is recommended to rent a car or campervan from Melbourne, as it is the largest city closest to the Great Ocean Road. Chances are that you’ll be in Melbourne and start the Great Ocean Road from there. 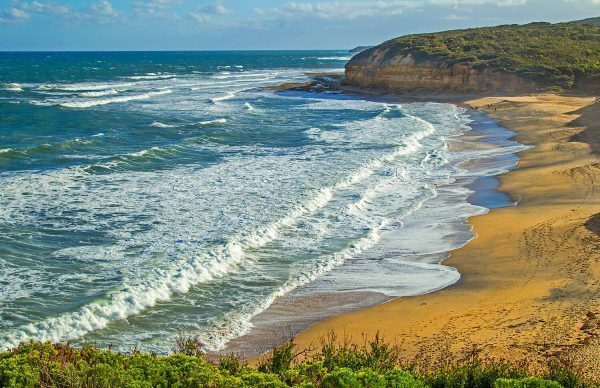 Melbourne is located east of the Great Ocean Road and it takes just 90 minutes to reach the town of Torquay, one of the world’s surf capitals and the starting point of this picturesque road. If you’re driving it between March and April, you’ll have the chance to see the famous Rip Curl Pro surfing competition at Bells Beach. And, if you’re a surfing enthusiast, then you’ll probably know already that Torquay is the home of two of the most famous surf brands: Rip Curl and Quicksilver. Pro surfers love this beach! So, why not take some time to surf or take some surfing lessons while you’re there? But, the primary reason to drive it east to west is that you’ll be driving on the left side of the road – closest to the ocean. This will allow you to pull over easily to stop at all the viewpoints. You drive on the left side of the road! As beautiful as this road can be, timing can make or break your trip. The best time to do the Great Ocean Road is during the summer months and autumn (in the southern hemisphere) – from November to the beginning of May. If possible, avoid the Christmas and Easter weeks, or any other holiday week/weekend as these tend to be very busy. Should you not be able to go during these months, June to October is still good enough but could be quite cold. Also take into consideration the school winter holidays, which are from mid-September to the beginning of October. Your research and planning should give you an idea of where you’ll end up each day to book your accommodation beforehand. Booking in advance is highly recommended especially if you’re traveling during the summer months –which is the best time to go– as accommodation can get very busy. 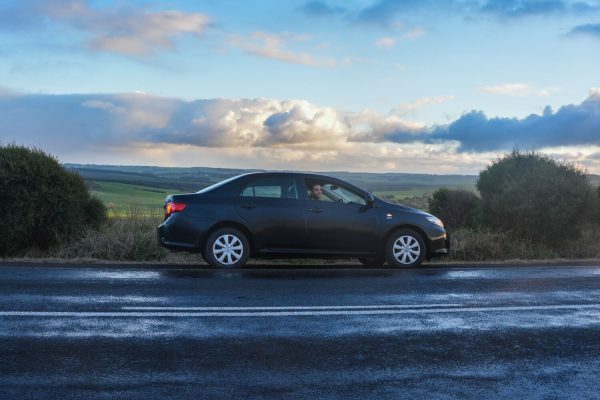 As mentioned before, you’ll discover some additional things to see and do as you drive, so allow some extra time on your schedule to explore these new things or to give yourself the flexibility to spend some extra time in the places you’re enjoying the most. While there are tons of things to do along the way, the Twelve Apostles are the reason why most people do this road trip. These massive limestone structures, formed over 20 million years ago through erosion, tower up to 45 meters above the ocean and stand next to a 70 meters high limestone cliff. It’s quite an impressive view! Even though it is called the Twelve Apostles, only eight “apostles” are still standing. To enjoy the apostles to its fullest potential, try arriving for sunrise. Not only you’ll see the spectacle of the sun rising and bathing the towers in a cool morning light, but you’ll also beat the tour buses and have the place almost to yourself. Also recommended is the sunset. While more crowded than the sunrise, it is quite striking seeing the sun setting over the ocean with the shaded silhouettes of the apostles in the foreground. Walk the boardwalks along the cliff tops to see various points of views of the apostles. Spend at least half a day here. This national park is home to the Twelve Apostles as well as the Gibson Steps, which will take you down to the beach to have a close-up view of the Twelve Apostles. 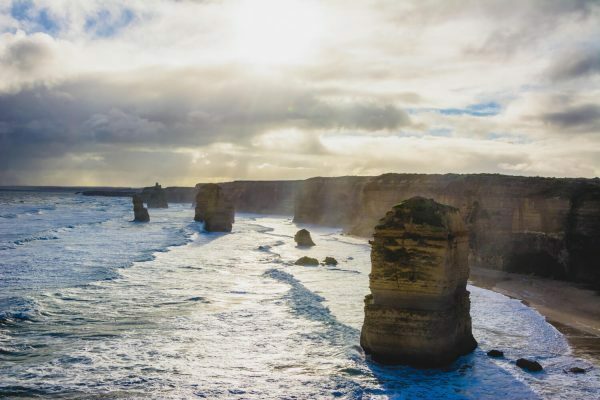 In the park, you’ll also find the Loch Ard Gorge, which is considered one of the most beautiful beaches on the Great Ocean Road; and The Grotto, which is basically a pool formed on a sinkhole next to the ocean that produces a beautiful view during low tide. Also worth mentioning are the London Arch and The Arch. Both are naturally formed limestone arches carved by the power of nature. 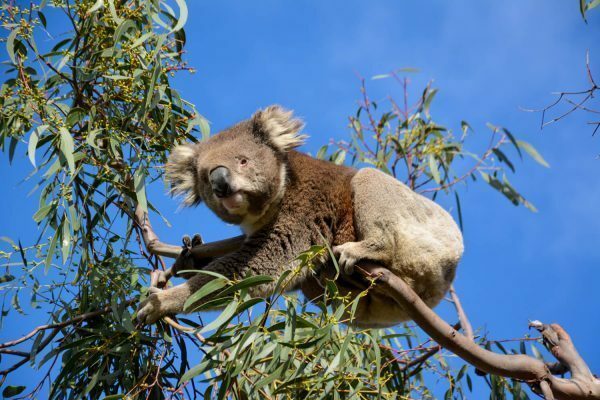 If you want to see koalas in the wild, then the Kennett River –along the Grey River Road– is your best option. As a good alternative, there’s the Otway Lighthouse Road, where you can also see the koalas sleeping on the trees by the side of the road or in the middle of town. A tip: If you’re in town and see a bunch of people looking up, they are probably Koala-spotting too. Just follow their gaze. Another set of rocks rising out of the ocean that unfortunately lives on the shadows of their most popular sister, the Twelve Apostles. If you have the time and are passing past Peterborough, spend some time here as they are just as beautiful as the rest. Change the scenery a bit by heading inland to immerse yourself into a forest full of tall trees, giant tree ferns, and a few waterfalls. There is a one-hour roundtrip hike to reach the platforms that will give you some of the best views of The Triplet Falls. Lorne is one of the many picturesque towns situated along the Great Ocean Road and a great spot to spend your first or second night since it is about 140km from Melbourne. It is also a popular spot to visit during Christmas, so have that in mind if you’re around during those days. 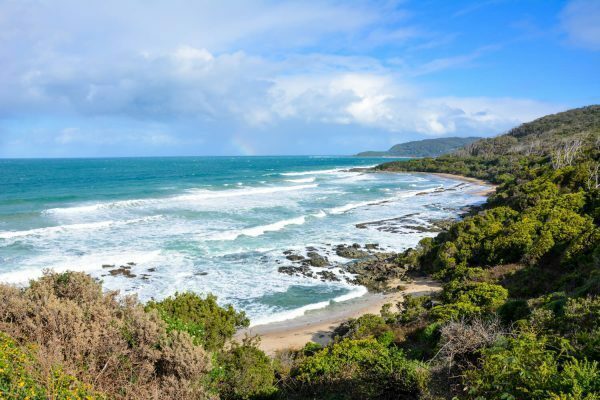 From Lorne, you’ll start one of the most picturesque portions of the Great Ocean Road which stretches up to Apollo Bay. Be ready to stop a lot for photos! This is one of my favorite lookouts in the entire Great Ocean Road. You can drive up to the picnic area, and from there have a short walk to the lookout, from where you’ll see the stunning view of a golden sand beach coming inland and blending with the greenery around it. This Google map below has the Great Ocean Road marked as well as the highlights mentioned here. If you’re doing a round trip from Melbourne, as recommended previously, drive along the coast from East to West and then drive back along the A1 highway inland. This will save you a few hours of driving. Try to not go below one-quarter of a tank before fueling up as there are portions of the road with large distances between gas/petrol stations. 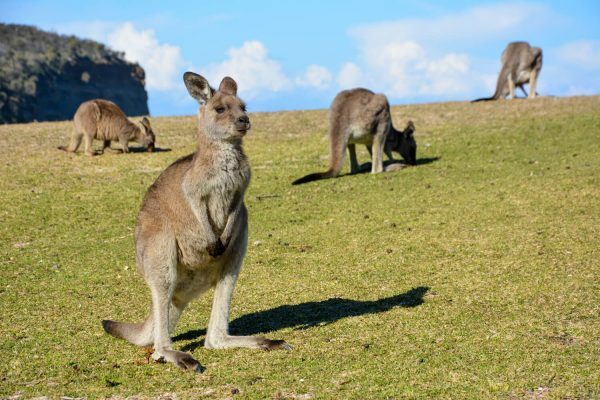 Wildlife spotting is relatively common in Australia, including the echidnas, koalas, and kangaroos – especially kangaroos. While spotting these is always a cool thing to do, be aware that they sometimes cross the road in front of you unexpectedly. It is recommended to drive with caution, alert, and a bit slower than the maximum speed to give you more time to react should one of these animals decide to give you an up-close experience. In that case, slow down and brake in a straight line – don’t do a sudden swerve as you could roll off the road. Last but not least, enjoy everything about this ocean road. Take pictures, but don’t forget to also live the moment! Image 3, 5, and 7 from Flickr’s Creative Commons. This post was done in collaboration with Trover, but as always, all the tips and opinions expressed here are mine. Good tips to know since Australia’s one of my dream locations due to me wanting to visit the Great Barrier Reef. Sadly, the reefs have deteriorated much due to pollution, etc. in the last few years, so I’m hoping to go there ASAP. And also good to know some other notable spots to visit in Australia! I’m also dying to go to the great barrier reef!